Ever since the new pope selected the papal name Francis, St. Francis of Assisi, who the pope honored by his choice, has been a hot topic. That's a good thing. St. Francis (b.1182-d.1226) personified love, compassion, peace and humility. There are quite a few self-absorbed people who do not consider those four traits qualities, but see them instead as weaknesses. Pope Francis has made it one of his missions to dispel that cynicism whenever he can. 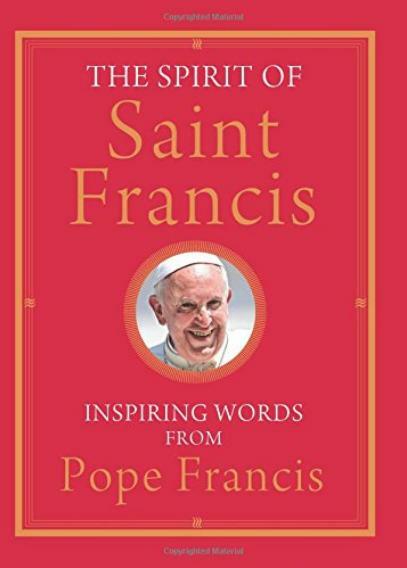 This book is made up of many short quotes from Pope Francis, all translations approved by the Vatican. Each of the ten sections is preceded by a quote from St. Francis, well selected, and well pared with the pope's quotes. The aim of these short readings are to strengthen faith and to give hope for a better, more loving future to the Catholic faithful in the economically advanced countries, who are suffering from spiritual depression. We need to implore his grace daily, asking him to open our cold hearts and shake up our lukewarm and superficial existence. Do Not Forget the Poor! The pope is an enthusiastic speaker, who loves to encourage the faithful to live dignified and fulfilled lives. His words are joyful, spontaneous, inspirational, positive, and uplifting. They are often infused with humor and self-deprecating comments about his own fallibility. Underlying the text is a call for lapsed persons of the Catholic faith to return to the sacraments of confession and communion, and to return to prayer and to acts of charity. There are pleas by the pope for the flock not to succumb to the banal, faithless life of secular societies, a life that can be short of morals and long on self-indulgence, which kills the good in mankind. For God's love burns away our selfishness, our prejudices, our interior and exterior divisions. The love of God even burns away our sins. I enjoyed most the more concrete quotes of ministry to the faithful and fallen Catholics alike. Love of God in Jesus always opens us to hope, to that horizon of hope, to the final horizon of our pilgrimage. I enjoyed least the very un-Catholic call for evangelizing. I've always admired my Catholic faith for being one of example, of everyday Catholics trying to be living examples of their faith's tenants. The evangelizing is to be done by the priest on Sundays at mass. Pope Francis has clearly embraced the widespread evangelical missions that have encroached on the Catholic faithful in many parts of the world. If you can't beat them, join them? Or perhaps it is the Jesuit in him speaking? Another oddity was the discarding of the capital letter for the pronoun referring to God, which I can only guess has fallen by the wayside in an effort to make the text more accessible to a wider audience. It is clear that the overwhelming goal of the book is to bring comfort from pain, and to make this a better world full of better people. That is a wonderful goal. The book is intended to be used as a book of prayer-meditation. Prayer is the breath of faith...prayer is the dialogue of the soul with God. The quotes have been chosen to encourage us to live more like St. Francis in spirit. That is also a wonderful thing, and a difficult thing to do in a world full of cynicism and materialism. In our society that sees goodness as stupidity, to be a good person is something very few understandably attempt. I don't ever want to live in Britain, a society that sees goodness as stupidity! Can it be true? Please, Lord, let it not be so! Somehow, I think this book would be wasted on such a society. But if you are someone who strives to be good, then this book might help heal the wounds suffered by evil, and encourage you not to abandon your honorable values. ...he is not abstract but has a name: God is Love. Published in cooperation with the Vatican, this original collection brings the life and legacy of Saint Francis of Assisi to life through the pope's uplifting and challenging words. By taking the name of one of the most venerated figures in Christendom, Pope Francis set a high bar for his papacy. Pope Francis often speaks and writes about Franciscan ideals such as simplicity, humility, forgiveness, joy, compassion, peacemaking, and care for creation. His inspirational homilies, addresses, and writings on these and other Franciscan themes are collected in this book for the first time, giving you a simple way to renew your faith. If you would prefer to go straight to the source, so to speak, here are some books with St. Francis's writings and prayers.